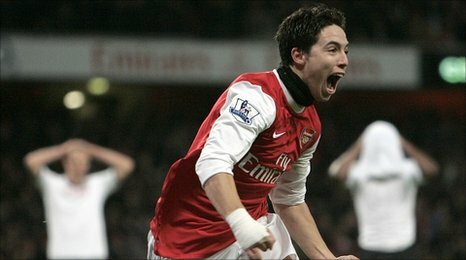 It were just two goals from Samir Nasri which guided Arsenal against Fulham to take them to the top of the charts by beating them 2-1.So now they are in total command of Premier league at the moment. Nasri got an early lead when he went past Fulham defences . But even though Fulham had something to offer when Kamara scored an equalizer. But it was Nasri who came as a saviour and scored a match deciding goal to seal their fortune At this juncture Arsenal stands an optimistic goal of getting past MANU after two back to back defeats behind them.Fulham on the other side had a pretty worse record, who have never been able to win a Premier League away game since last season. Fulham were about to make an upset while they were pressing hard on the Arsenal to score an equalizer but failed to do so. Keeping on the momentum Arsenal's forward Andrey Arshavin charged and was going to make a cushioned volley but that was beautifully defied by keeper Schwarzer. Arsenal kept on dominating by getting lion's share in the possession and neat passing between Mariuane Chamakh and Tomas Rosicky thus constructed opening.It was just a matter of time Fulham's defence had been breached and Hughes charged towards the point. While he was losing control over the ball be cleverly passed the ball to Nasri. So smartly as he made through the two defenders and scored an amazing left foot shot into the net. So like this Arsenal kept on slicing Fulham, but fell to their weakness of over elaboration, this was seen when Chamakh vaguely passed the ball to Wilshere while the strong striker would have finished the chance.So it was Fulham who extensed Arsenal's lead.After Nasri had been cutting ball across the goal, Schwarzer did well in saving and Ethhu also poked across his goal. This match was not without an incident where Squillaci accidently head butted team mate Koscielny as they were attempting to fend off a high ball. In the mean while Fulham striker Dempsey got the possession and evaded the ball from Song with great piece of footwork and later releasing the ball to Kamara. He instantly curled shot past Fabianski which was pretty important putting time in mind. While Wenger was distraught that referee Chris Foy had not stopped the match for Koscielny's head injury, which caused him to be taken off on a stretcher and replaced with Johan Djourou.So here Fulham got back into the game , and before the half time there was ample chance for both the teams to make their mark. Bacary Sagna whipped over a cross for Chamakh, who headed straight into Schwarzer's arms, and then Kamara breached the offside trap to get one-on-one with Fabianski, forcing the Pole to save smartly. In the second half Arsenal used some strategy with went along the flow pretty well, Schwarzer did some intelligent footwork, in the mean while he saved a good low from Arshavin. Robin van Persie replaced Rosicky just after the hour, as the match briefly became bad-tempered. Songa slashed wildly over when Pansil gave ball away following some bad moments probably facing heat of the moment. Though Fabianski scrammed towards the ball but unfortunately Zoltan Gera had things under control, and making a good overhead kick just wide. After sliding the ball past Schwarzer and opened up the goal way too wide- but nonethelss Nasri spanned his body round before Brede Hangeland to score the penultimate goal of the match and he failed to back his cover.Djourou then nearly put the ball into his own goal but, luckily, his awkward header flew wide before Chamakh again failed to hit the target with a decent opportunity.Gera was again threatning but Fabianski had everything under control.So Arsenal were home after a well fought match, thanks to timely shots by Nasri who made some intelligent moves to make sure Arsenal had made it too the top of Premier League. This is a very good tip particulaly to those new to the blogosphere. Simple but very precise information… Thank you ffor sharing this one.